A Atomic is a levitating enemy similar to Prime's Pulse Bombus in Phendrana Drifts and Phazon Mines. 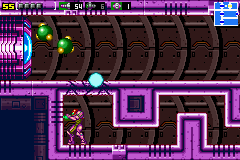 Atomics are found in Metroid Prime 3: Corruption, Super Metroid, and Metroid: Zero Mission. The Atomics appear in the Space Pirate Mother Ship. They are green and yellow in appearance and are able to shoot electrical shocks. The Atomics seem to be used by Zebesians as guards. They will attack Samus if she is near. Samus only encounters them after she has obtained the Legendary Power Suit. The Atomics in Super Metroid are found in the Wrecked Ship. They are green in appearance, and will float around the rooms seeking out Samus. When Samus first enters the Phantoon-ravaged, powered down ship, Atomics are seen in glass chambers attached to the floors and ceilings of certain rooms; they cannot be destroyed, not even with the wall-penetrating Wave Beam. It seems Space Pirates had used electricity from their body as a source of power for the ship. After defeating Phantoon, the ship will be powered up, revisiting the previously mentioned rooms will reveal that all Atomics have broken free. The broken chambers show exposed wiring that can damage Samus and released Atomics will attack her with electrical shocks when she is near. Atomics appear only in the wreckage of the G.F.S. Theseus and in the derelict G.F.S. Valhalla. They are red in appearance, and will move toward Samus when using the Charge Beam. These creatures are nearly identical to Prime's Pulse Bombus, even sharing the same Charge Beam weakness. The Pulse Bombu in the G.F.S. Theseus will disappear after it is defeated and Samus continues her mission. Atomics are creatures comprised entirely of energy. A strong energy blast is adequate to destabilize the Atomic and cause it to explode. They are sustained by their core, which generates a constant supply of electricity. When an abundance of energy has been produced, the Atomic will discharge a section of its body in the form of an explosive projectile. When near sources of energy of an opposite polarization, the Atomic will respond aggressively. This page was last edited on 31 July 2013, at 05:23.